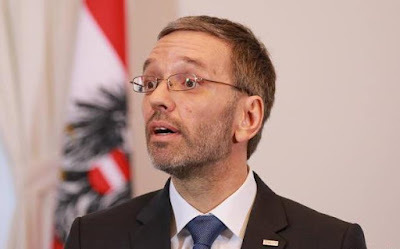 Austrian Interior Minister Herbert Kickl has written to the European Union, warning of a renewed migrant crisis and calling for immediate preventative measures to be taken, local media reported on Tuesday. The letter, published by the Krone newspaper, was specifically addressed at three European Commissioners, Dimitris Avramopoulos of migration, Johannes Hahn of neighbourhood policy, and Guenther Oettinger of budget and human resources. Kickl said figures from EU law enforcement agency Europol suggested that a “large-scale movement of people from Turkey to Europe’’ is about to take place. He noted that both the eastern Mediterranean and Balkans migration routes would likely be traversed as they were during the migrant crisis in 2015 and 2016. According to Kickl, there are presently “tens of thousands” of migrants in these areas already, including about 5,000 each in Bosnia and Herzegovina and Serbia. He added that about 60,000 asylum seekers were in Greece, and about 5.6 million Syrian refugees in the Middle East. “All of this points to clear potential for a massive new migration wave if action is not taken quickly,’’ the minister stressed. He called on the three commissioners to act quickly and send a clear signal to relevant EU member states, by “reconciling our respective contingency plans’’. “In addition, it is particularly important to learn what measures and initiatives are planned by the European Commission. “Austria is prepared to take every available measure to prevent illegal migration,’’ he said. Kickl, however, added that countries in the Western Balkans as well as Turkey have an obligation to play their part in hindering the further travel of migrants and refugees.